We are Nokota horses. On hot summer days we graze out in the field all day, but when the bugs gets too annoying we take a siesta and hang out by the front porch at our barn, away from the sun, away from the bugs. We accumulate a lot of raw energy from all that resting and grazing. Late in the evening when the sun gets below the tree tops, or on any cloudy day like yesterday, we turn up the heat and show our real colors. This is five year old Bluebell Star, a full-blooded Traditional Nokota© Horse and she runs this outfit. Her first three years of her life she spent in North Dakota at the Kunz family ranches, where she learned a lot from her mother Black Spotted Socks and all the other Nokota horses. 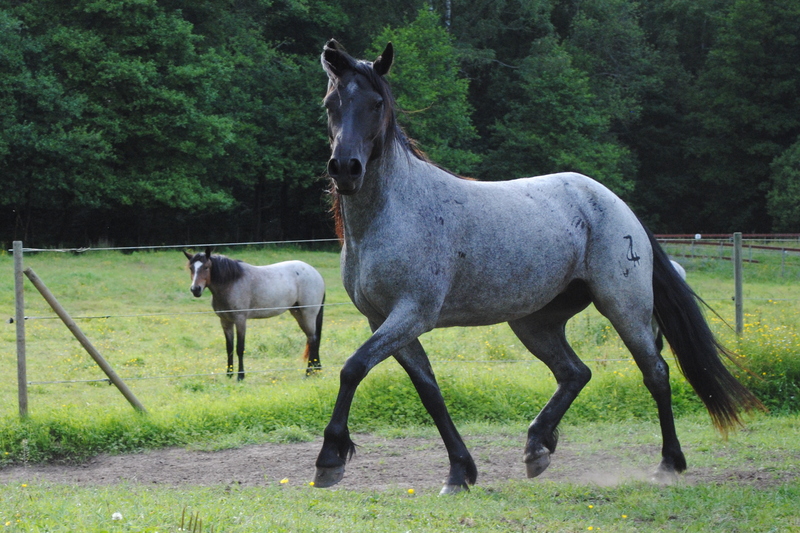 She is a proud blue roan and perfectly aware of her beauty. She is the calmest and most trusty of horses, steady as a rock but also a bit shy, but make no mistake; underneath that calm facade unimaginable powers lurks. When her face switches expression she takes the lead. To catch her picture with a camera is not easy, it takes a fast well-oiled shutter, patience and a truckload of luck. She seems to like the camera though, so she gives us many chances. 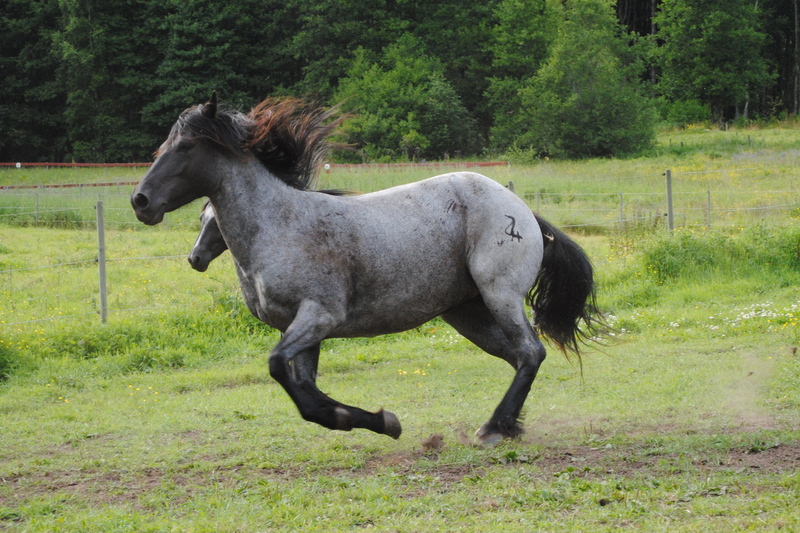 Bluebell’s friend is the three-year-old red roan Windflower Dancer. 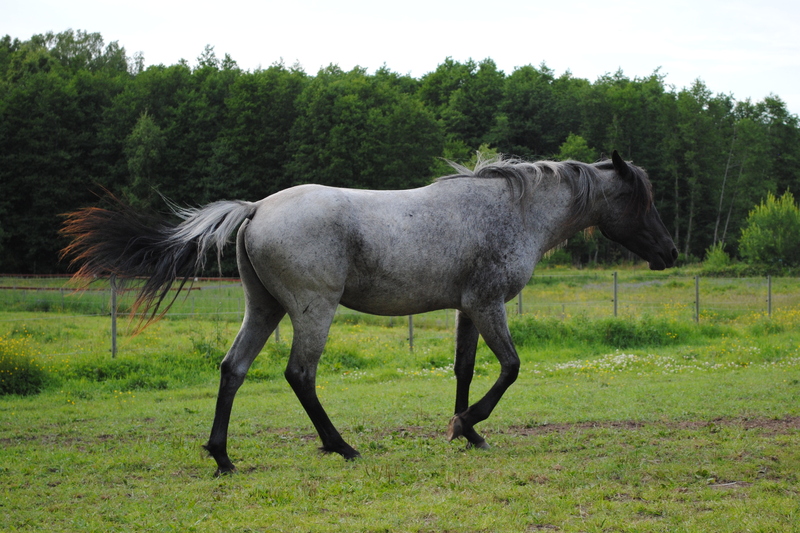 She is also very cool as a typical Nokota horse and very self confident. Bluebell can be a bit jumpy at times, probably because her mother taught her to be careful and always look out. Windflower is a quiet horse and easy to work with and loves attention, but she demands respect. I am convinced she can read thoughts so one must keep ones mind quiet when working with Windflower and with the right approach she welcomes you to her world with a big Little Missouri badlands grin. Wild Prairie Rose is our youngest, she is two summers. She came to us as a small filly freshly weaned from her mother Lucky Dust who was born in the wild and removed from the Theodore Roosevelt National Park in 2003. Her beauty is impossible to catch in a photograph. 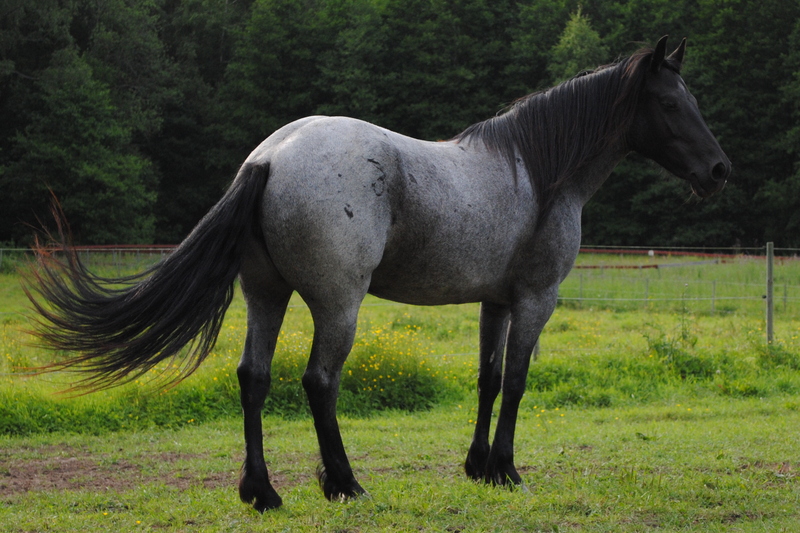 She is a light blue roan, but her appearance bear witness of many fine ancestors in a colorful past. Because of her young age when she joined our family is very attached to us, but she is also a “teenager” and has a wild soul, able to switch temperament with the situation. A wonderful horse friend both competitive and safely calm. This was a summer postcard from the Werner family in Sweden, we hope you enjoy the look of these wild horses from the northern plains. 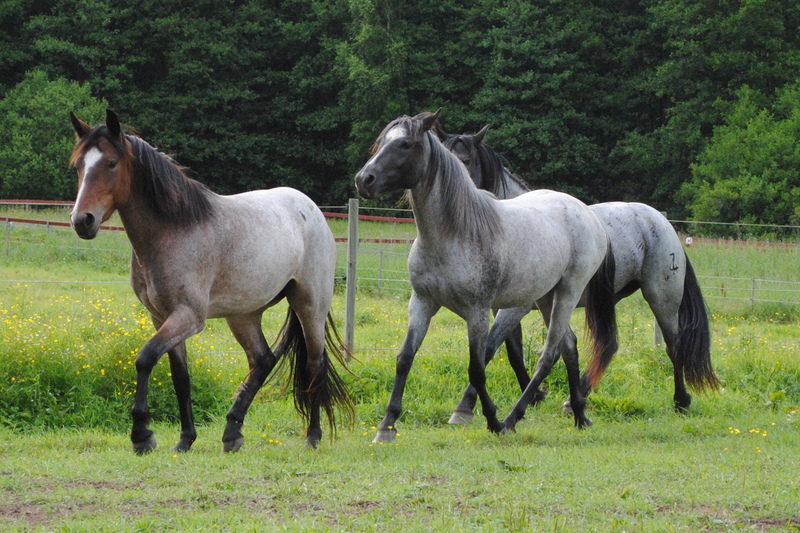 The horses are here in Sweden to stay and in the future there will hopefully be many more. Together with their relatives in Linton North Dakota they make up an endangered breed of horses. 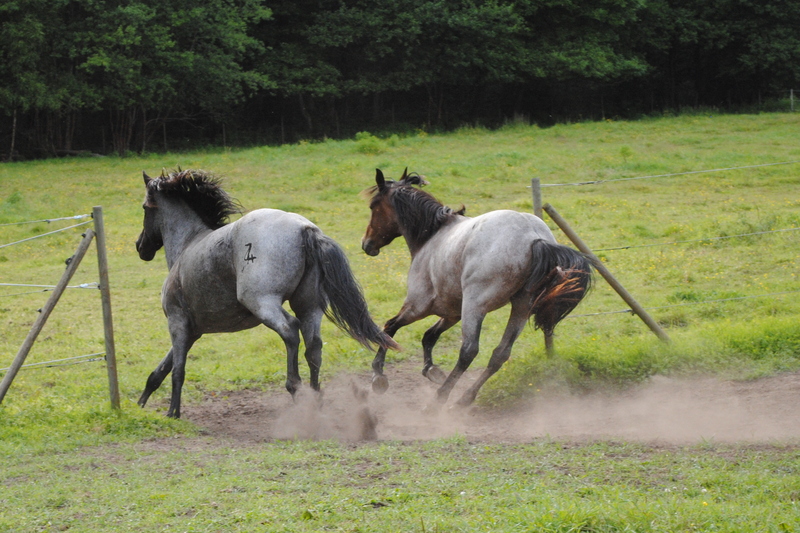 Visit The Nokota Horse Conservancy to read more about them and the work to save them. 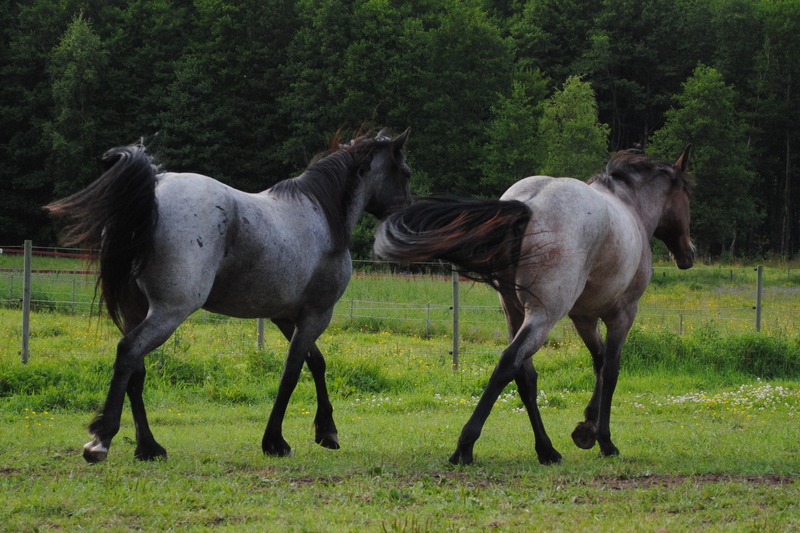 This entry was posted in Our horses and tagged Hästar, Horses, nokota, photography, Wild horses. Bookmark the permalink. Beautiful! I agree, it’s so tough to photograph the nuance and action that our “eye-cameras” see. Great job here and nice descriptions of your lovely herd! on the first of August we go to our wyoming cabin, I will share some of our horse pics then. How long will you be in Wyo? I’m moving my daughter into her apartment in Ft Collins and strategizing with my painting partner there. What part of Wyo is your cabin? If you aren’t too far north, maybe we could connect……..
What else would you expect from a bunch of carefree young “ladies”? Certainly not restrained formality! I love these pictures. I’m wondering if you would let me use your images for a painting or two. 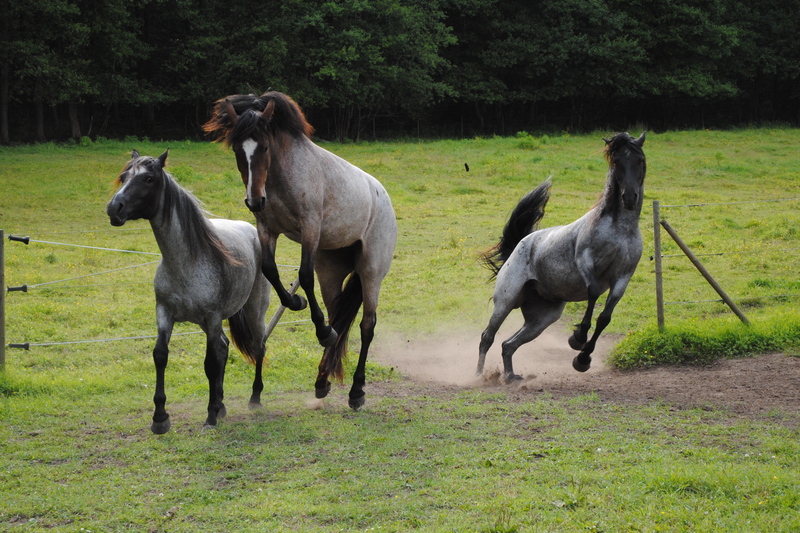 I won’t take your composition, I’ll combine the horses/poses into a larger herd. Please let me know if that would be okay. I’m planning an art show of equine subjects, “High Point,” a play on words for an art show in Colorado, (high point), the competition award, the feeling you get when all comes together after a ride, (high point of my days), and of course, our show will be the high point of the art & horse season. Thank you for asking and yes of course you may. We wish you good luck! Thanks so much. I’ll post some of the pictures that will be in the show at equitherapy. I think these might be some of your most beautiful photos yet! Stunning. You are so kind Eira and you have followed them from the start so you have seen the changes. Hope you are home safely on the Big Isles after your great adventure. Wonderful photos! I can hear their tails swishing, and the thundering of their feet on the ground! 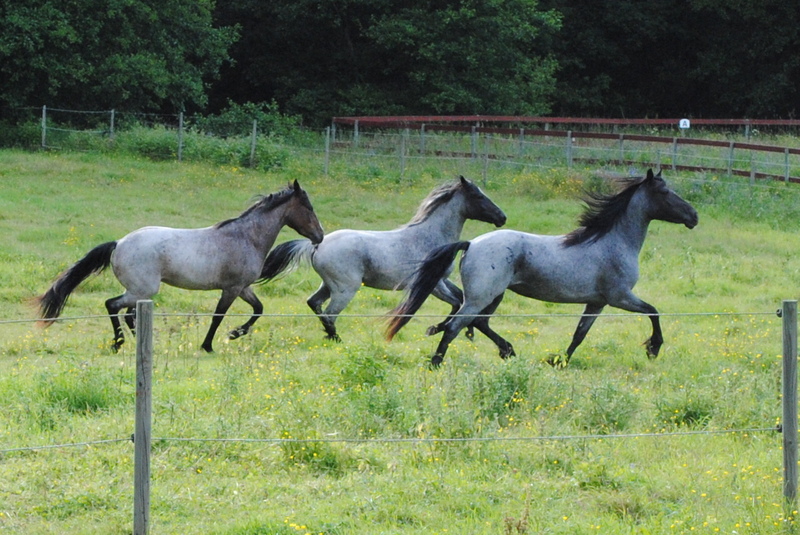 What a great series of wonderful photographs updating us about your Nokota© Horses. And, Bluebell Star is certainly the spunky one leaving a trail of dusk during her race with Windflower Dancer.